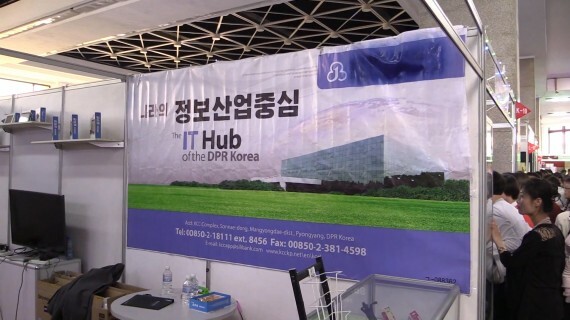 When he wasn’t taking stunning panorama photographs around Pyongyang, Singapore-based photographer Aram Pan had time to visit this year’s Pyongyang Spring International Trade Fair (???????????). The fair was twice as big this year as it had been in 2013 according to state media, and it’s easy to see why when you watch a 3-minute video shot by Pan. The place is bustling with people browsing and buying all manner of products. As Pan notes in the opening of the video, all transactions that take place at the event are settled in Chinese Yuan, Euros or U.S. Dollars. 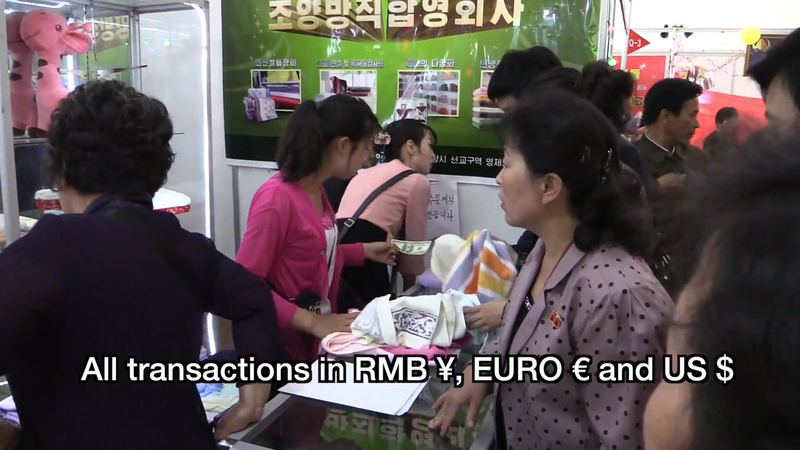 In fact, a booth worker can be seen handling U.S. currency in one scene in the video. This isn’t perhaps surprising when many retailers and products have come from overseas. 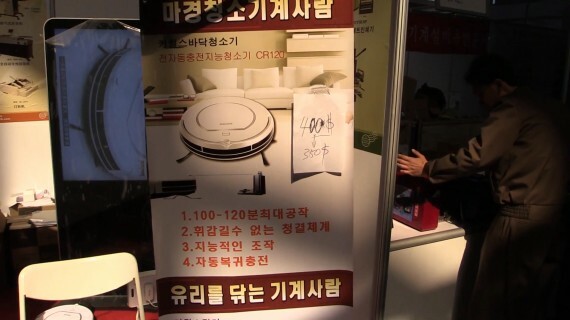 One of the perhaps most surprising products to see on sale was a robot vacuum cleaner — a pretty luxurious item to own even in richer countries. The price has been reduced from $400 to $350. 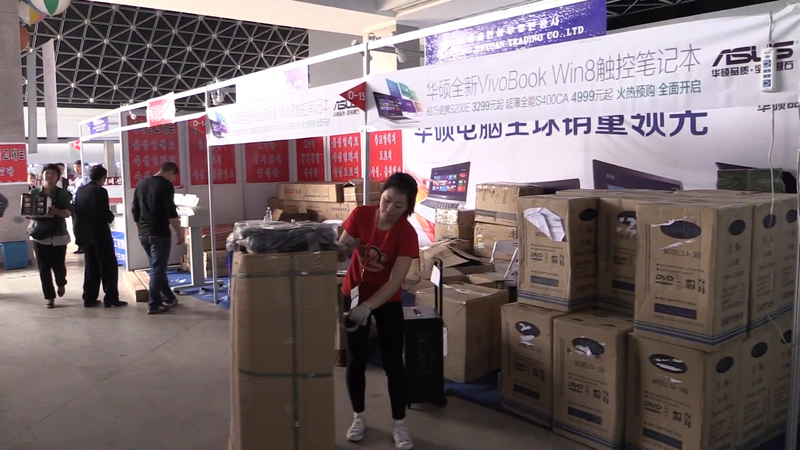 It’s the Ecovacs CR120, a Chinese-made vacuum cleaner that appears to be available on Amazon China at an 849 yuan (US$136) retail price. Not a bad profit for the seller in Pyongyang, then. Laptop PCs were on show and on sale. Here’s a line of them at a Chinese vendor. 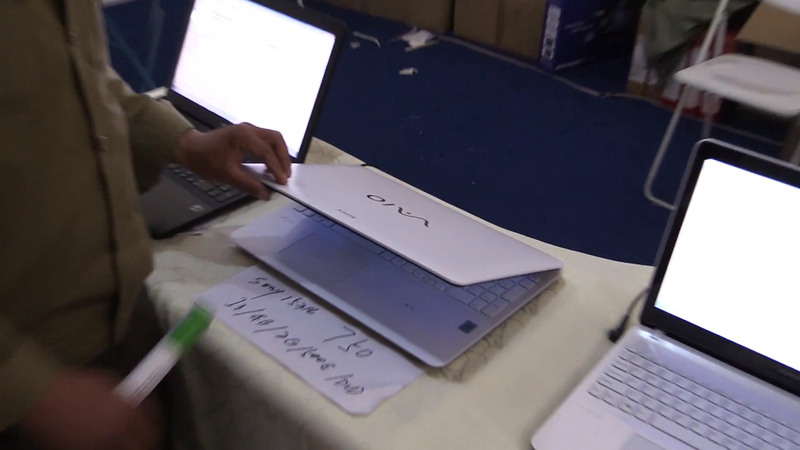 The one in the foreground is $330 and there was a Sony Vaio on sale for $750. 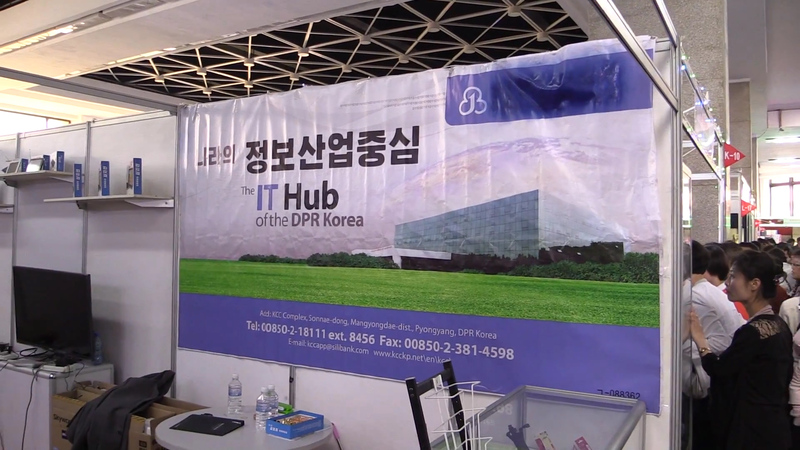 The Korea Computer Center, which is North Korea’s main IT trading house and development center, had its own booth. The company is usually there and in the past has used the trade fair to launch new models of tablet computer. The devices are made by Chinese vendors, labeled with the KCC logo and have typically run Google’s Android operating system with customization and software from KCC. 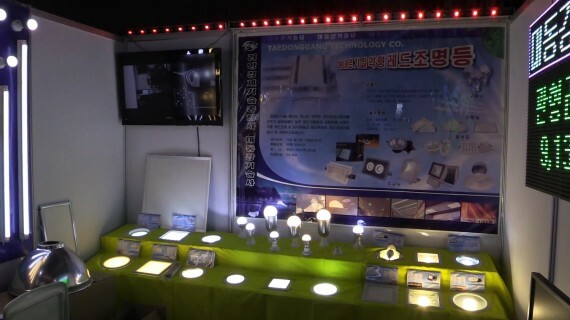 This time, tablets were also on show. Some computer peripherals were also shown in the video, including USB flash memory sticks. 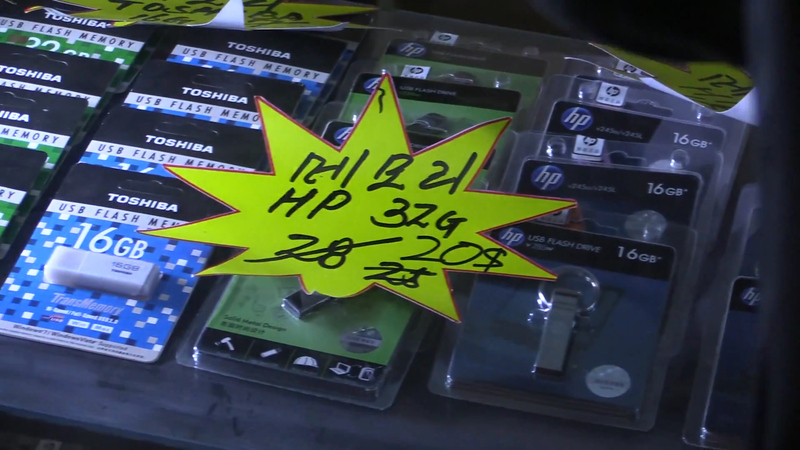 These are reportedly popular with PC users because they can be used to store and trade TV shows and movies that are smuggled into North Korea from outside the country. Here, a 32-gigabyte HP memory stick has seen its price dropped from $28 to $25 and then $20. The same product is $15.80 on Amazon U.S., so the price at the trade fair isn’t unreasonable. 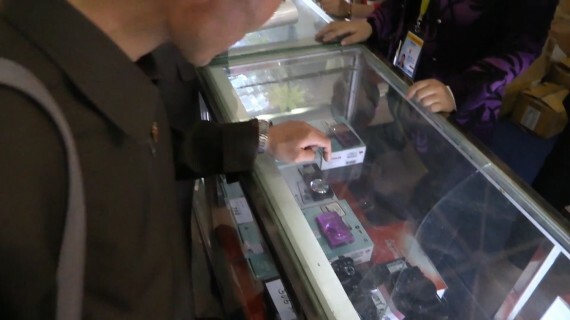 The video also showed several Canon digital still cameras on sale, one of which attracted the attention of at least one potential buyer. 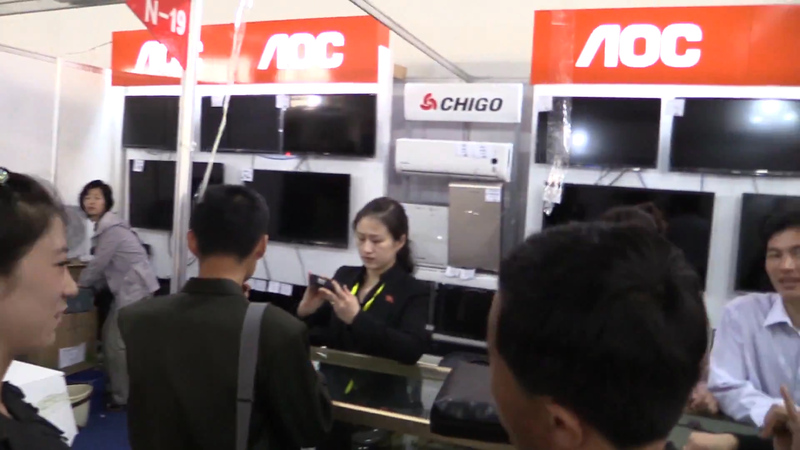 A couple of companies were showing flat-panel TV sets, including cheaper AOC ones from China and much nicer and more expensive ones from Sharp in Japan. The brand label of Sharp can also been seen on a washing machine in the lower left corner of the image below. 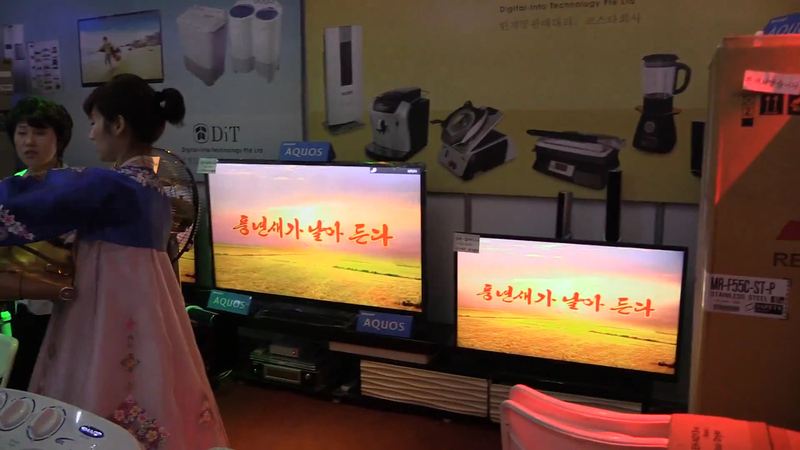 North Korean media has recently reported on the development and growing use of LED lights in the country and there were some on display by Pyongyang’s Taedonggang Technology Co.
Windows 8 computers from Taiwan’s Acer were also being promoted and a couple of women were captured walking with what looks like a rather nice Panasonic rice cooker. 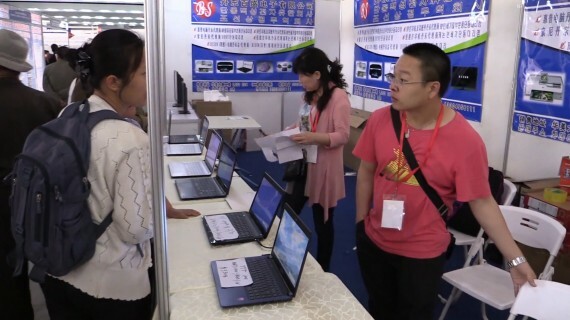 Liaoning Shangda Industrial Development Co.
1 Comment on "Another look at the Spring Trade Fair"
I am convinced that existence of DPRK is strongly supported by enemies of Korea (unified korea). This brings tears to my eyes. 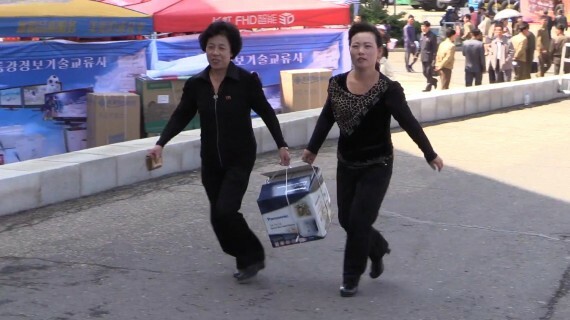 Koreans should support other koreans first.